Donald Trump just made one of the most brilliant moves of his entire presidency. President Donald Trump knocked the Federal Reserve for continuing to raise interest rates despite some recent market turbulence. “I think the Fed is making a mistake. They are so tight. I think the Fed has gone crazy,” the president said after walking off Air Force One in Erie, Pennsylvania for a rally. That may be one of the greatest things that Donald Trump has ever said. And if Trump feels like his base is really responding to this sort of rhetoric, he may start using it as a campaign tactic. Could you imagine thousands upon thousands of supporters chanting “End the Fed” at Trump rallies leading up to the 2020 election? That would definitely be a beautiful thing. Without a doubt, the Federal Reserve has created “the everything bubble”, and when it bursts the economic pain is going to be off the charts. Of course the left is going to want to blame Trump, and so Trump is being very smart by pointing a finger at the Fed for aggressively raising rates at a time when the U.S. economy is already slowing down. Sources within the auto industry, in addition to major suppliers PPG Industries and Trinseo, have suggested to the “Mad Money” host that there is a “definitive slowdown” in auto sales. Key economic building blocks — things like packing materials and plastic — are either stagnant or dropping in price, indicating a slowdown in shipping, a leading barometer for the state of the economy, Cramer said. Needless to say, criticizing the Federal Reserve is a very dangerous thing to do, and there is a reason why previous presidents have never dared to do so. But that is one of the great things about Trump. He simply refuses to be controlled, and he will not be intimidated by threats. We desperately need a president that is willing to stand up to the elite and call for the abolition of the Federal Reserve. For a long time it appeared that doing something about the Fed was not on Trump’s radar, but now that may be changing. So let us hope that Trump’s war with the Federal Reserve escalates significantly, because we want this to be a top national issue during the 2020 presidential election. #1 We like to think that we have a government “of the people, by the people, for the people”, but the truth is that an unelected, unaccountable group of central planners has far more power over our economy than anyone else in our society does. #2 The Federal Reserve is actually “independent” of the government. In fact, the Federal Reserve has argued vehemently in federal court that it is “not an agency”of the federal government and therefore not subject to the Freedom of Information Act. #3 The Federal Reserve openly admits that the 12 regional Federal Reserve banks are organized “much like private corporations“. #4 The regional Federal Reserve banks issue shares of stock to the “member banks” that own them. #5 100% of the shareholders of the Federal Reserve are private banks. The U.S. government owns zero shares. #6 The Federal Reserve is not an agency of the federal government, but it has been given power to regulate our banks and financial institutions. This should not be happening. #7 According to Article I, Section 8 of the U.S. Constitution, the U.S. Congress is the one that is supposed to have the authority to “coin Money, regulate the Value thereof, and of foreign Coin, and fix the Standard of Weights and Measures”. So why is the Federal Reserve doing it? #8 If you look at a “U.S. dollar”, it actually says “Federal Reserve note” at the top. In the financial world, a “note” is an instrument of debt. #9 In 1963, President John F. Kennedy issued Executive Order 11110 which authorized the U.S. Treasury to issue “United States notes” which were created by the U.S. government directly and not by the Federal Reserve. He was assassinated shortly thereafter. #10 Many of the debt-free United States notes issued under President Kennedy are still in circulation today. #11 The Federal Reserve determines what levels some of the most important interest rates in our system are going to be set at. In a free market system, the free market would determine those interest rates. #12 The Federal Reserve has become so powerful that it is now known as “the fourth branch of government“. #13 The greatest period of economic growth in U.S. history was when there was no central bank. #14 The Federal Reserve was designed to be a perpetual debt machine. The bankers that designed it intended to trap the U.S. government in a perpetual debt spiral from which it could never possibly escape. Since the Federal Reserve was established 100 years ago, the U.S. national debt has gotten more than 5000 times larger. #15 A permanent federal income tax was established the exact same year that the Federal Reserve was created. This was not a coincidence. In order to pay for all of the government debt that the Federal Reserve would create, a federal income tax was necessary. The whole idea was to transfer wealth from our pockets to the federal government and from the federal government to the bankers. #16 The period prior to 1913 (when there was no income tax) was the greatest period of economic growth in U.S. history. #17 Today, the U.S. tax code is about 13 miles long. #18 From the time that the Federal Reserve was created until now, the U.S. dollar has lost 98 percent of its value. #19 From the time that President Nixon took us off the gold standard until now, the U.S. dollar has lost 83 percent of its value. #20 During the 100 years before the Federal Reserve was created, the U.S. economy rarely had any problems with inflation. But since the Federal Reserve was established, the U.S. economy has experienced constant and never ending inflation. #21 In the century before the Federal Reserve was created, the average annual rate of inflation was about half a percent. In the century since the Federal Reserve was created, the average annual rate of inflation has been about 3.5 percent. #22 The Federal Reserve has stripped the middle class of trillions of dollars of wealth through the hidden tax of inflation. 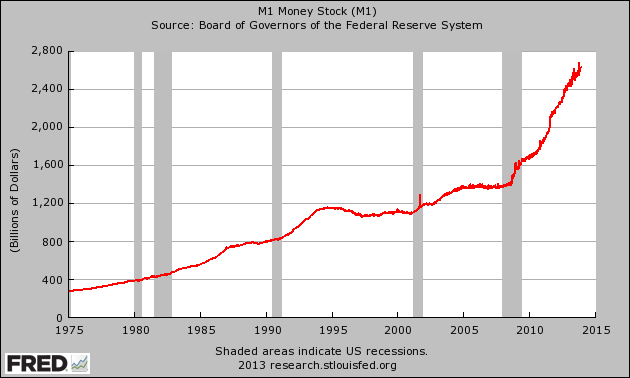 #23 The size of M1 has nearly doubled since 2008 thanks to the reckless money printing that the Federal Reserve has been doing. #24 The Federal Reserve has been starting to behave like the Weimar Republic, and we all remember how that ended. #25 The Federal Reserve has been consistently lying to us about the level of inflation in our economy. If the inflation rate was still calculated the same way that it was back when Jimmy Carter was president, the official rate of inflation would be somewhere about 10 percent today. #26 Since the Federal Reserve was created, there have been 18 distinct recessions or depressions: 1918, 1920, 1923, 1926, 1929, 1937, 1945, 1949, 1953, 1958, 1960, 1969, 1973, 1980, 1981, 1990, 2001, 2008. #27 Within 20 years of the creation of the Federal Reserve, the U.S. economy was plunged into the Great Depression. #28 The Federal Reserve created the conditions that caused the stock market crash of 1929, and even Ben Bernanke admits that the response by the Fed to that crisis made the Great Depression even worse than it should have been. #29 The “easy money” policies of former Fed Chairman Alan Greenspan set the stage for the great financial crisis of 2008. #30 Without the Federal Reserve, the “subprime mortgage meltdown” would probably never have happened. #31 If you can believe it, there have been 10 different economic recessions since 1950. The Federal Reserve created the “dotcom bubble”, the Federal Reserve created the “housing bubble” and now it has created “the everything bubble” which threatens to plunge us into the worst economic downturn in world history once it bursts. #33 The Federal Reserve also paid those big banks $659.4 million in “fees” to help “administer” those secret loans. #34 During the last financial crisis, big European banks were allowed to borrow an “unlimited” amount of money from the Federal Reserve at ultra-low interest rates. #35 The “easy money” policies of Federal Reserve Chairs Ben Bernanke and Janet Yellen have created the largest financial bubble this nation has ever seen, and this has set the stage for the great financial crisis that we are rapidly approaching. #36 Since late 2008, the size of the Federal Reserve balance sheet has grown from less than a trillion dollars to more than 4 trillion dollars. This is complete and utter insanity. #37 During the quantitative easing era, the value of the financial securities that the Fed accumulated was greater than the total amount of publicly held debt that the U.S. government accumulated from the presidency of George Washington through the end of the presidency of Bill Clinton. #38 Overall, the Federal Reserve now holds more than 32 percent of all 10 year equivalents. #39 Quantitative easing creates financial bubbles, and when quantitative easing ends those bubbles tend to deflate rapidly. #40 Most of the new money created by quantitative easing has ended up in the hands of the very wealthy. #41 According to a prominent Federal Reserve insider, quantitative easing has been one giant “subsidy” for Wall Street banks. #42 As one CNBC article stated, we have seen absolutely rampant inflation in “stocks and bonds and art and Ferraris“. #44 Most people have never heard about this, but a very interesting studyconducted for the Bank of England shows that quantitative easing actually increases the gap between the wealthy and the poor. #45 The gap between the top one percent and the rest of the country is now the greatest that it has been since the 1920s. #46 The mainstream media has sold quantitative easing to the American public as an “economic stimulus program”, but the truth is that the percentage of working age Americans that have a job is actually much lower than it was just prior to the last recession. #47 The Federal Reserve is supposed to be able to guide the nation toward “full employment”, but the reality of the matter is that nearly 102 million working age Americans do not have a job right now. That number has risen by about 27 million since the year 2000. #48 For years, the projections of economic growth by the Federal Reserve have consistently overstated the strength of the U.S. economy. But every single time, the mainstream media continues to report that these numbers are “reliable” even though all they actually represent is wishful thinking. #49 The Federal Reserve system fuels the growth of government, and the growth of government fuels the growth of the Federal Reserve system. Since 1970, federal spending has grown nearly 12 times as rapidly as median household income has. #50 The Federal Reserve is supposed to look out for the health of all U.S. banks, but the truth is that they only seem to be concerned about the big ones. In 1985, there were more than 18,000 banks in the United States. Today, there are only 6,891 left. #51 The six largest banks in the United States (JPMorgan Chase, Bank of America, Citigroup, Wells Fargo, Goldman Sachs and Morgan Stanley) have collectively gotten 37 percent larger over the past five years. #52 The U.S. banking system has 14.4 trillion dollars in total assets. The six largest banks now account for 67 percent of those assets and all of the other banks account for only 33 percent of those assets. #53 The five largest banks now account for 42 percent of all loans in the United States. #54 We were told that the purpose of quantitative easing was to help “stimulate the economy”, but today the Federal Reserve is actually paying the big banks not to lend out 1.8 trillion dollars in “excess reserves” that they have parked at the Fed. #55 The Federal Reserve has allowed an absolutely gigantic derivatives bubble to inflate which could destroy our financial system at any moment. Right now, four of the “too big to fail” banks each have total exposure to derivatives that is well in excess of 40 trillion dollars. #56 The total exposure that Goldman Sachs has to derivatives contracts is more than 381 times greater than their total assets. #57 Federal Reserve Chairman Ben Bernanke has a track record of failure that would make the Chicago Cubs look good. #58 The secret November 1910 gathering at Jekyll Island, Georgia during which the plan for the Federal Reserve was hatched was attended by U.S. Senator Nelson W. Aldrich, Assistant Secretary of the Treasury Department A.P. Andrews and a whole host of representatives from the upper crust of the Wall Street banking establishment. #59 The Federal Reserve was created by the big Wall Street banks and for the benefit of the big Wall Street banks. #60 In 1913, Congress was promised that if the Federal Reserve Act was passed that it would eliminate the business cycle. #61 There has never been a true comprehensive audit of the Federal Reserve since it was created back in 1913. #62 The Federal Reserve system has been described as “the biggest Ponzi scheme in the history of the world“. #63 The following comes directly from the Fed’s official mission statement: “To provide the nation with a safer, more flexible, and more stable monetary and financial system.” Without a doubt, the Federal Reserve has failed in those tasks dramatically. #64 The Fed decides what the target rate of inflation should be, what the target rate of unemployment should be and what the size of the money supply is going to be. This is quite similar to the “central planning” that goes on in communist nations, but very few people in our government seem upset by this. #65 A couple of years ago, Federal Reserve officials walked into one bank in Oklahoma and demanded that they take down all the Bible verses and all the Christmas buttons that the bank had been displaying. #66 The Federal Reserve has taken some other very frightening steps in recent years. For example, back in 2011 the Federal Reserve announced plans to identify “key bloggers” and to monitor “billions of conversations” about the Fed on Facebook, Twitter, forums and blogs. Someone at the Fed will almost certainly end up reading this article. #67 Thanks to this endless debt spiral that we are trapped in, a massive amount of money is transferred out of our pockets and into the pockets of the ultra-wealthy each year. This year, the federal government will spend more than half a trillion dollars just on interest on the national debt. #68 In January 2000, the average rate of interest on the government’s marketable debt was 6.620 percent. If we got back to that level today, we would be paying more than a trillion dollars a year just in interest on the national debt and it would collapse our entire financial system. #72 Of course the U.S. government could actually create money and spend it directly into the economy without the Federal Reserve being involved at all. But then we wouldn’t be 21 trillion dollars in debt and that wouldn’t serve the interests of the bankers at all. #74 The United States now has the largest national debt in the history of the world, and we are stealing more than 100 million dollars from our children and our grandchildren every single hour of every single day in a desperate attempt to keep the debt spiral going. #76 At this moment, the U.S. national debt is sitting at $21,594,438,319,301.65. If we had followed the advice of Thomas Jefferson, it would be sitting at zero. #77 When the Federal Reserve was first established, the U.S. national debt was sitting at about 2.9 billion dollars. On average, we have been adding more than that to the national debt every single day since Barack Obama first entered the White House. #78 We accumulated nearly as much new debt during the 8 years of the Obama administration than we did under all of the other presidents in all of U.S. history combined. #79 If all of the new debt that has been accumulated since the Republicans took control of Congress had been given directly to the American people instead, every household in America would have been able to buy a new truck. #80 Between 2008 and 2012, U.S. government debt grew by 60.7 percent, but U.S. GDP only grew by a total of about 8.5 percent during that entire time period. #81 Since 2007, the U.S. debt to GDP ratio has increased from 66.6 percent to 105.4 percent. #82 According to the U.S. Treasury, foreigners hold approximately 5.6 trillion dollars of our debt. #83 The amount of U.S. government debt held by foreigners is about 5 times larger than it was just a decade ago. #84 As I have written about previously, if the U.S. national debt was reduced to a stack of one dollar bills it would circle the earth at the equator 45 times. #85 If Bill Gates gave every single penny of his entire fortune to the U.S. government, it would only cover the U.S. budget deficit for 15 days. #86 Sometimes we forget just how much money a trillion dollars is. If you were alive when Jesus Christ was born and you spent one million dollars every single day since that point, you still would not have spent one trillion dollars by now. #87 If right this moment you went out and started spending one dollar every single second, it would take you more than 31,000 years to spend one trillion dollars. #88 In addition to all of our debt, the U.S. government has also accumulated more than 200 trillion dollars in unfunded liabilities. So where in the world will all of that money come from? #89 The greatest damage that quantitative easing has been causing to our economy is the fact that it is destroying worldwide faith in the U.S. dollar and in U.S. debt. If the rest of the world stops using our dollars and stops buying our debt, we are going to be in a massive amount of trouble. #90 Over the past several years, the Federal Reserve has been monetizing a staggering amount of U.S. government debt even though the Fed previously promised that this would never happen. #91 China recently announced that they are going to quit stockpiling more U.S. dollars. If the Federal Reserve was not recklessly printing money, this would probably not have happened. #93 There are plenty of possible alternative financial systems, but at this point all 187 nations that belong to the IMF have a central bank. Are we supposed to believe that this is just some sort of a bizarre coincidence? An immensely powerful international organization that most people have never even heard of secretly controls the money supply of the entire globe. It is called the Bank for International Settlements, and it is the central bank of central banks. It is located in Basel, Switzerland, but it also has branches in Hong Kong and Mexico City. It is essentially an unelected, unaccountable central bank of the world that has complete immunity from taxation and from national laws. Even Wikipedia admits that “it is not accountable to any single national government.” The Bank for International Settlements was used to launder money for the Nazis during World War II, but these days the main purpose of the BIS is to guide and direct the centrally-planned global financial system. Today, 58 global central banks belong to the BIS, and it has far more power over how the U.S. economy (or any other economy for that matter) will perform over the course of the next year than any politician does. Every two months, the central bankers of the world gather in Basel for another “Global Economy Meeting”. During those meetings, decisions are made which affect every man, woman and child on the planet, and yet none of us have any say in what goes on. The Bank for International Settlements is an organization that was founded by the global elite and it operates for the benefit of the global elite, and it is intended to be one of the key cornerstones of the emerging one world economic system. #95 The borrower is the servant of the lender, and the Federal Reserve has turned all of us into debt slaves. #96 Debt is a form of social control, and the global elite use all of this debt to dominate all the rest of us. 40 years ago, the total amount of debt in our system (all government debt, all business debt, all consumer debt, etc.) was sitting at about 3 trillion dollars. Today, the grand total is approaching 60 trillion dollars. #97 Unless something dramatic is done, our children and our grandchildren will be debt slaves for their entire lives as they service our debts and pay for our mistakes. #98 Now that you know this information, you are responsible for doing something about it. #99 Congress has the power to shut down the Federal Reserve any time that it would like. But right now most of our politicians fully endorse the current system, and nothing is ever going to happen until the American people start demanding change. #100 The design of the Federal Reserve system was flawed from the very beginning. If something is not done very rapidly, it is inevitable that our entire financial system is going to suffer an absolutely nightmarish collapse. #101 Shutting down the Federal Reserve would make Donald Trump a national hero, and potentially one of the greatest presidents in United States history. October 12, 2018 in Uncategorized. “Deal Or War”: Is Doomed Dollar Really Behind Obama’s Iran Warning?